It's really easy to recommend the Samsung Galaxy Tab Pro 8.4 (outside the part where you actually have to pronounce its name). This slate easily has the best screen, the top-performing hardware, the best software package, and, if you must ask, the best camera in its class. If you want a mid-sized tablet for both multimedia and work, Galaxy Tab Pro 8.4 is certainly one of the best choices out there. Samsung has finally put some extensive work on the user interface and the new Magazine homescreens and widgets are spot on. We feel those should have come a few generations earlier to utilize the full potential of the previously underdeveloped homescreen panes. Condensing so much information on so little space in a meaningful way is a great feat and we have no doubt this approach might shape the industry in the near future. Samsung has also ditched the old and ugly design of the notification area for a much better looking and user friendly one. There is a new music player too, plus Samsung gives you an excellent mobile office - arguably the best we've seen to date. The Galaxy Tab Pro 8.4 is a milestone in the Android tablet usability and it's a benchmark other should live up to. Slim, powerful, beautiful and jam packed with features - it really doesn't get much better than that. The obvious downside is that the thing doesn't come cheap. Along with the Retina-packing iPad mini, this is the costliest mid-sized tablet, but you can easily see Samsung's point with this one. It all boils down to what you really need - an oversized smartphone of a tablet or a powerful multi-tasker like the Galaxy Tab Pro 8.4. Samsung is offering the Tab Pro in three different sizes - 8.4, 10.1 and 12.2 inches. They all share absolutely identical specs, save for the screen and battery capacities. There is even a Note Pro 12.2 in case you fancy the S-Pen features. But if you are reading this review, you probably have already set your mind for the smallest member of the family. What now remains to be see is if the 8.4-inch Galaxy Tab will be able to handle the Apple iPad mini 2 with Retina display. Even though both devices share the same form factor, they offer completely different user experiences and target somewhat different user groups. The Apple iPad mini 2 is great for games and relies heavily on the Apple eco-system and it wealth of tablet-optimized apps. It certainly has the upper hand with the superior choice of both productivity and time-killer apps. The Samsung Galaxy Tab Pro 8.4 is better tailored to the people who would use their tablet do some work and who would appreciate the unparalleled multi-tasking and the flexibility that comes with an open file system. If you fall into that second group of people and you haven't already invested a lot of money into iOS apps, it's certainly worth considering the Galaxy Tab Pro 8.4. 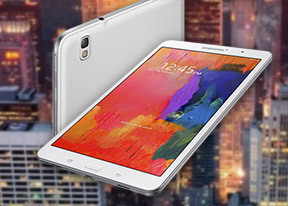 There is one other reason to pick the Galaxy Tab 8.4 - while the base price of the two slates is about the same, the Samsung tablet comes with a microSD card slot for cheaper expansion. The 32GB version of Retina iPad mini, which we find way useful will cost you an extra €100. LG G Pad 8.3, is an excellent alternative to those looking to fit within a more reasonable budget and don't mind settling for slightly less processing power to achive it. The G Pad is offers great design with a metal back, a Full HD IPS display and a still capable Snapdragon 600 chipset . So picking between those two is as easy as deciding on your budget really - spend a sensible amount and get a good tablet or go all in and get the very best of the droid land. Samsung Galaxy Tab Pro 8.4 ticks all the right checkboxes to be a great tablet. It has a top-notch screen, a super fast chipset and plenty of exclusive software tricks to survive in the increasingly crowded market. More impressively, it has no major gaps in its armory, just like you'd expect from a flagship device. Sure, it's expensive, but until its impressive user experience is matched by a cheaper slate we can't really call it overpriced. It's a gadget to be looking up to and a companion, whose presence will be enjoyed by everyone.